BEGINNINGS Original plan to make Grenada and then to continue around the world ! 1964/5: idea formed by Nick [?]. Advertisement placed in Yachting World for third member with a boat. Two and half years planning and preparation. THE CREW Lewis Nicholls now living in Bohemia. Lewis 36 years old in 1968. He’d done a bit of sailing (2 week sailing trips, etc). Always had “godawful weather”. Noel Nicholls (‘Nick’) cousin of Lewis. Was divorced at time of trip. Now deceased. Nick six years older than Lewis, so 42 at time of trip. Nick didn’t seem to have any fluid in his ear-tubes [??] Nick was an “enthusiastic amateur sailor”, interested in tech/electonics, etc. Nick and Lewis both worked at Elliott Brothers at Boreham Wood. Stanley Brooks skipper and boat owner, very experienced seaman. Deceased. At the time he answered advertisement, he was living in St Catherine’s Dock on his boat. Stan had been married a couple of times. 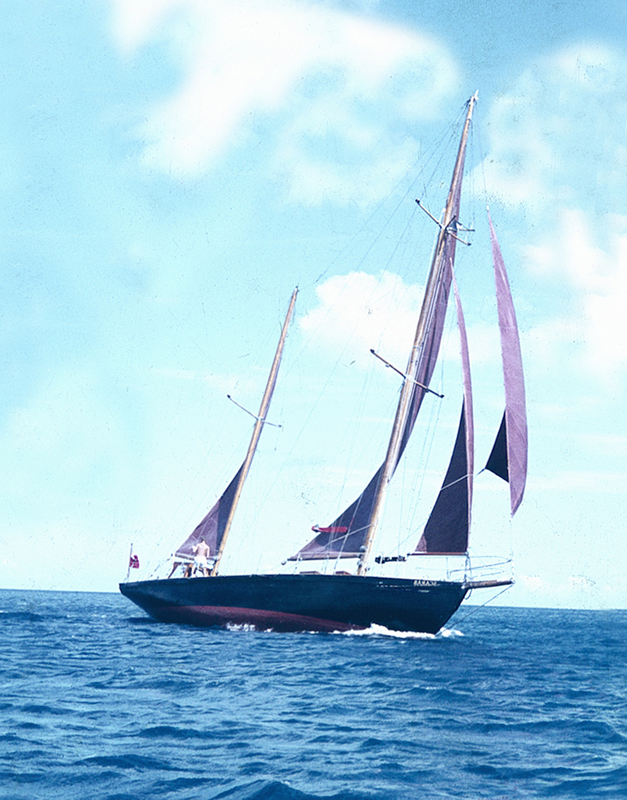 Stan had been a sailor all his life and had tremendous experience in long-distance ocean racing as a crew member. 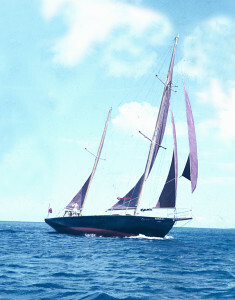 Stan would have been about 52 at the time of the sailing. THE SCARAB Ketch so, what actually is a ketch? 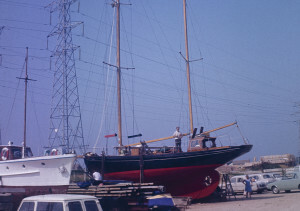 A ketch is a two-masted boat in which the mizzen (the rear mast) is forward of the rudder post and shorter than the main mast. Now you know. The Scarab is a 52ft ketch and is not only thought to have been German, but to have been used by Nazis to escape from Germany after the WW2 to South America. 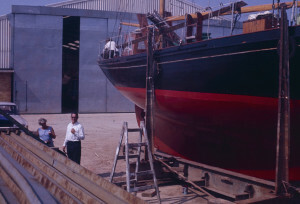 The boat had been bought by Stanley from South America who arranged for it to be brought back to Europe. It was a timber, ex-racing boat, built around 1900 at Hamburg. It was fitted with 5 bunks – and two hammocks. It had been built to a ‘class specification’ [?]. It was smaller than a J Class boat [!]. Stan had changed the name from a German one (something ending in …Hof] to ‘The Scarab’. 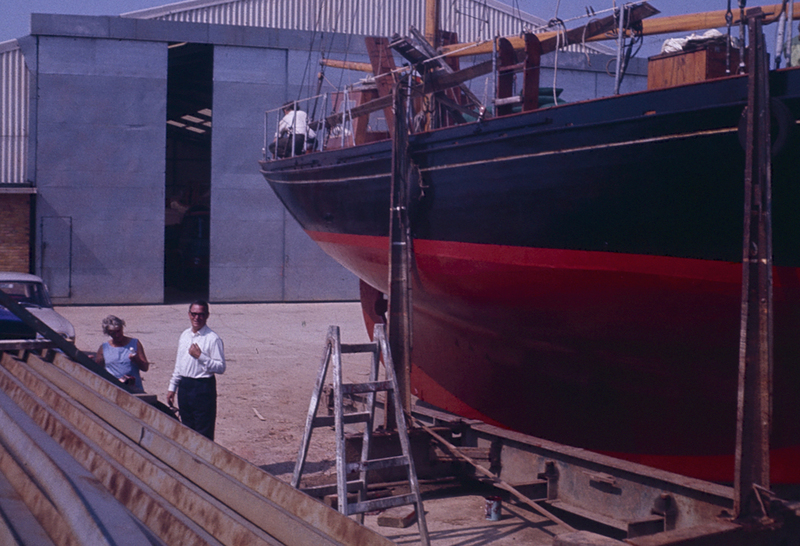 Colours of the boat: a black hull, raw teak deck (unvarnished, to prevent slipping). Everything was varnished except the deck. Autopilot there was an autopilot – fitted by Nick and Lewis prior to setting off. Solar distillery As a precaution, Lewis took along a ‘solar distillery’, bought at a government surplus store which would have been used had they had to abandon ship. It was never even opened. It would have been capable of producing a pint of fresh water a day. PICTURE. THE ROUTE London to Poole The boat was moored at St Catherine’s Dock in London and had to be sailed to Poole for preparation for the journey. 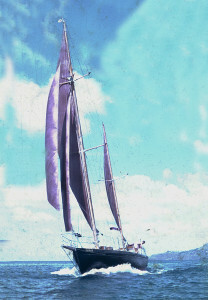 Soon after leaving the Thames a ‘tropical storm’ was encountered which blew the boat to Le Harvre in France. 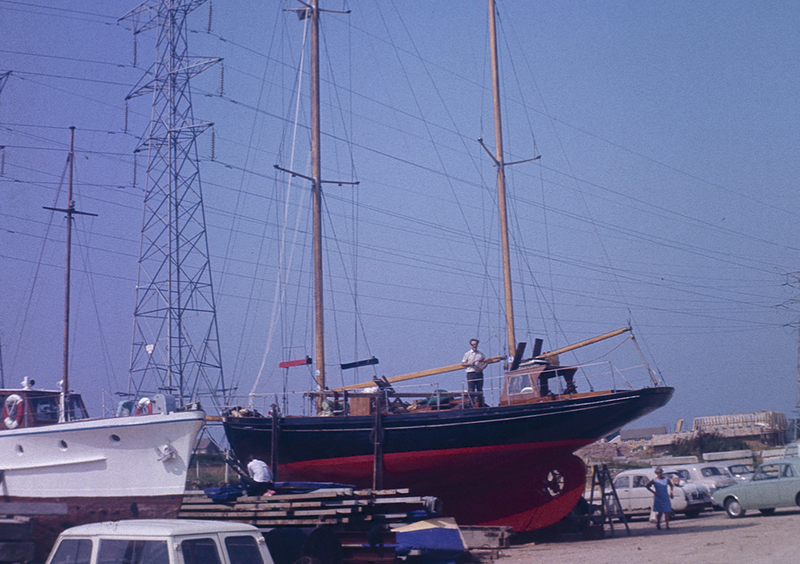 The crew waited for two weeks for calmer weather before proceeding to Poole. Poole to Oporto (Portugal). Oporto to MadeiraMadeira. The Canaries. Grenada. 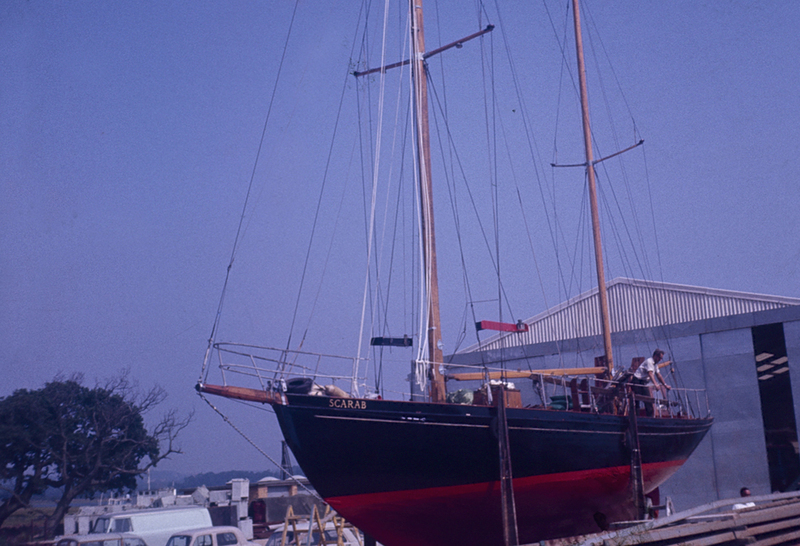 October 1968: boat leaves Poole, after long delays due to “terrible weather”. 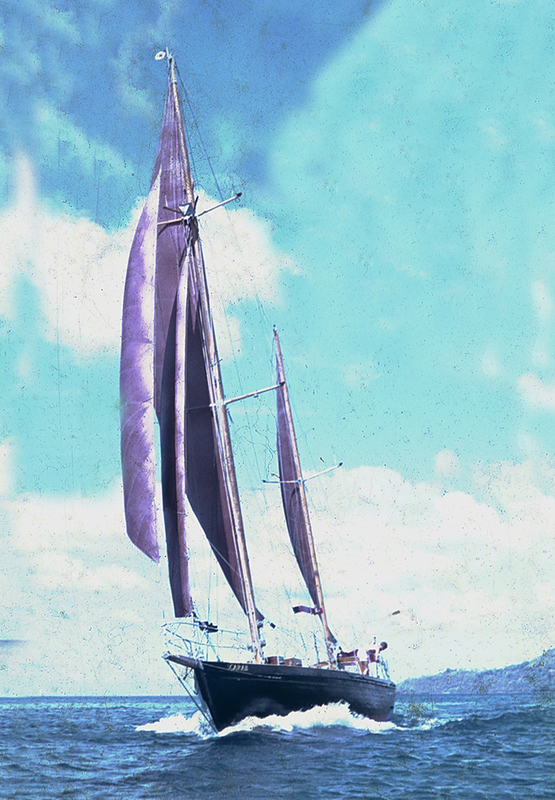 1969: boat arrives Grenada. The end of the Atlantic adventure, but the beginning of another in Grenada. Christmas Day 1968 found the trio in mid Atlantic. ROUTINE LIFE ON BOARD Drink Alcohol on board? Hardly ever any drinking, just the occasional social indulgent luxury. There were two separate water tanks below cabin floor level plus “loads of sealed helf- and quarter-gallon plastic bags of water”. If the tanks ran dry, the bags were the emergency water supply. Food Lewis did a lot of the cooking, especially in the trade winds. A bonus was the odd flying fish which landed on the boat. “Nice, tastes like herring”. The fare was mostly reconstituted food from packets or tins. Dry food is a lot easier to store. Democracy all decision making was very democratic. All discussed what to do. There was first-class guidance from Stan. Although basically democratic any final decision re safety etc was always by Stan. Keeping watch there was always someone on watch. It was okay to doze or sleep if you were in the cockpit and the boat was not near shipping lanes. The cockpit had a windscreen and canopy over the top. In the Trade Winds and away from the shipping lanes there was no real possibility of a collision, then it was okay to sleep next to the wheel. Near the shipping lanes one had to stay away for the whole (four hour) watch. Washing and bathing washing the body was done using seawater, [perhaps fresh water was used to rinse?? Lewis not sure]. UPSETS EN ROUTE Twang in the night Lewis was asleep on his watch when he was awoken by a loud ‘twang’. He couldn’t see what was wrong. Everything seemed okay. It took a long while to work out what had happened. One of the two ‘sheet winches’ had given way. The retaining nut on top of one of the winches had come undone and flown off. The whole winch had come apart. Lewis found the winch but not the retaining nut. No convenient ships’ chandlers to pop into for a replacement. They had to wait until they reached Grenada before they could get a retaining nut. Becalmed! Ship is becalmed mid-Atlantic [?] for a week [?]. No wind. Skipper decided to use the engine as keen to make some progress. At one point, all three members of the crew [foolishly?] went swimming – no-one left on boat! Fishing – the one that got away: Lewis was fishing with a spinner at end of strong multi-strand cord of Terylene. “the line just snapped – it must have been an enormous fish”. Shark? Lewis very inexperienced at the time. Seasickness Lewis suffered badly from seasickness. It came as a “real revelation” when he was told how to cope with it: he was encouraged to stay on deck and to throw up over the side of boat. With the Trade Winds there was a slow “continuous wide roll” which didn’t upset Lewis. Storms bad one experienced on way in to Funchal, Madiera. Had to ‘hove to’ (broadside on to the weather], lashing the tiller and using a small forsail. Very uncomfortable – staying below for “what seemed like days”. Same thing happened at La Palma in Canaries. AFTERTHOUGHTS Fear was Lewis scared? “I just tagged along. I had tremendous confidence in Stan”. Ship’s Log is with Stan Brooks’ daughter – Lewis may be able to obtain it. 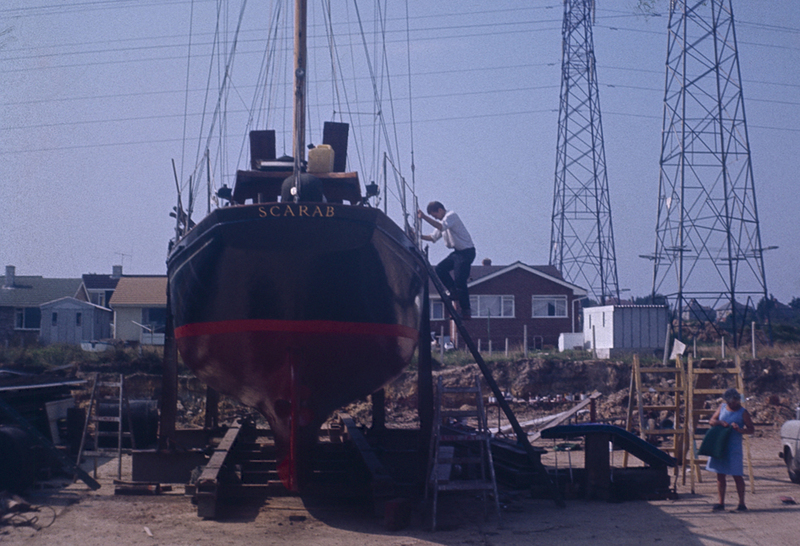 The Scarab at Cobbs Quay, Hamworthy, Poole, 1968.